Mat show kits have mat, back and bag. Welcome to Showpack Central! The mat, back and clear, resealable bag combination is now a staple of the art world. 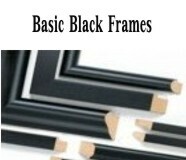 Perfect for transportation and protection of matted art and perfect for gallery display bins. We have one of the largest offerings if not the largest offering of Show Kits in the industry. We offer the Show Kits in all of our in-stock mat variations. Click on image to see size and color choices. Our best-selling 4-Ply archival cotton rag mats, archival backing and archival resealable clear bags combined to make a show kit. Buffered mats have 1/8" cotton covered foam core backs. Unbuffered, Photo Rag, have 4 ply Photo Rag backs for a consistent unbuffered environment. All museum grade material. Choice of White or Super White color. Mat window is centered so show kit can be used for horizontal (landscape) or vertical (portrait) images. Use at outdoor art shows, gallery bins or simply combined with your art for a decades fresh gift. 1 click away! Get the Best of the Best in one simple click. 8-ply archival cotton picture mat, archival back and crystal clear, resealable bag. Buffered mats have 1/8" archival cotton on foam core backs. Unbuffered, Photo Rag, have 4 ply Photo Rag backs for a consistent unbuffered environment. Mat window is centered so it can be used as a horizontal or vertical picture image. These archival cotton mats use museum grade matboard used to frame fine art from around the world for centuries. Cotton mats are the highest quality mats in the mat and frame industry. Choice of White and Super White color. Approximately .120 of an inch thick (8 ply). Great for art shows, art bins and simply as a gift. 12 Ply Archival Cotton Archival back and Archival, Clear as glass, resealable bag in one easy to order kit. Buffered mats have 1/8" archival cotton on foam core backs. Unbuffered, Photo Rag, mats have 4 ply Photo Rag backs for a consistent unbuffered environment. Yes, they all fit in the bag. This is the top of the line. The best and thickest mat we produce, available only from MATcutter.com. And, you get all the drama, prestige and beauty offered in an in-stock mat package. Plus, you can get any size through our Custom Section. One click to get it all: 4 ply white conservation picture mats, 1/8" white conservation foam core plus archival clear bags in a show kit. Our 4 ply conservation mats are archival paper mats created to emulate archival cotton mats. Plus, they have Artcare™ technology from Nielsen Banbridge built in. Artcare is an addition to the mat that helps resist deterioration due to pollution and acid causing properties in the environment. Choice of Smooth White or Deep Black color. Mat windows are centered so they can be used horizonally or vertically..
1 stop shopping for art show presentations. Mat, back and a bag is the basic sales tool for selling art. Mats packaged with 1/8 inch white conservation grade white foam core plus crystal clear and resealable bags. Mats are made from black core, conservation grade mat board. Available in Smooth White and Deep Black. Mat windows are centered. This allows them to be used with horizontal (landscape) or vertical (portrait) images. Perfect show kit for gallery bin, outdoor show or presentation. Also gives you ability to have a white archival mat with a black bevel or a black mat with matching black bevel. Conservation mat with centered window so it can be used as a horizontal picture mat or a vertical mat. They are the finest alpha-cellulose mats in the industry. The mat board has been treated with calcium carbonate to retard acidification. These mats are highly respected Artcare™ mats from Nielsen Bainbridge. Artcare™ is an ingredient added to the mats to resist acid producing elements from the environment or other materials. Approximately .080 to .090 of an inch thick, 6 ply. They come in Smooth White and Deep Black. We offer them all! Even a show kit in Archival 6 Ply Black Core with 1/8" White Archival Foam Core and Archival Clear Bags. Combine the contrast of black core bevels with the impact or 6 ply, 50% thicker than standard mats, plus all the ingredients for presentation of your art. A mat, a back and a bag kit ready for your next show or presentation. Your images are secure in our conservation mats with added Artcare® technology that fights pollutants and other factors that could harm your image. Available in Smooth White and Deep Black face color. Mats openings are centered so they can be used with horizontal and vertical images. Showpack made with conservation grade mat board constucted just like cotton mats.. Unlike most paper based conservation mat board which is a core with a paper cover on the top to create the mat color and paper on the back, these mats are a "board"...the top, middle and bottom of the mat board is the same material. This produces a luxiurious and traditional look. Show kit includes mat in Gallery White or Light Cream, conservation grade foam core back and super clear, resealable bag. Mat window is centered so show kit can be used for horizontal (landscape) or vertical (portrait) images.. This Showpack has it all. Value, impact and quality in one mat kit. Conservation mat is constructed just like museum grade cotton rag mats...the top, middle and bottom are all the same material and the same color. Popular Gallery White color. Mat window is centered so it can be used with horizontal (landscape) or vertical (portrait) image. Show kit includes 1/8 inch white conservation foam core and clear, resealable bag. A show stopper that will increase attention to your work and increase your sales. "Value Line" conservation, paper mats produced to emulate the archival qualities of museum grade cotton mats. Great for shows when your work needs more than standard mats but you do not need archival cotton mats. This show kit includes 4 ply, white core conservation picture mats in Black and Gallery White, conservation grade archival foam core backs and resealable, crystal clear presentation bags with a Showpack price. Mat openings are centered so kit can be used with horizontal (Landscape) images or vertical (Portrait) images. A great pre-cut mat kit for photos, printed images and originals. One "add to cart" gives you our best selling standard Tru-White™ core picture mat (.050-055 of an inch, 4 ply). 1/8" white acid free foam core back and super clear, resealable bag. So simple!. Mat window is centered so show kit can be used with horizontal (landscape) or vertical (portrait) images. This is our best selling Showpack because the mat is so crisp and clean and, unlike so called economy mats, is both acid free and lignin free. Your customers will see quality and value. Available in White White and Black. Just added to our popular Tru-White™ core line. 7 ply, .095 thick mat versus standard .050. Tru-White™ mats are not only acid free, they are lignin free (the property that produces acid and is still present in economy mats). Avilable in White White and Black. Mat window is centered so it can be used with portrait (vertical) or landscape (horizontal) images. Mat is combined with 1/8" white foam core and clear as glass, resealable bag. This is a show kit that will attract customes to your presentation because of its clean appearance and huge window bevel. Try this profit maker at your next show. Add drama and contrast to your images with our 4 ply Black Core standard mat, 1/8" white foam core back and clear, resealable bag in a 1 click show kit. Surface papers are heavy so black core does not show through mat color. Black core is clean and defect free. Mat windows are centered so they can be used with vertical (portrait) or horizontal (landscape) images. Available in Bright White and Black face color. Fast becoming the new standard for shows, white core! Inexpensive 4 ply, economy white core picture mat in Paper White, Off White and Black, inexpensive back and reclosable, clear bag in a show kit package. Your choice of foam core backing or mat board backer. Mat window is centered and can be used with horizontal or vertical art work. Economy mats (often sold as standard mats) are slightly thinner, .045, 100% recycled materials and use less expensive dyes for the face color. You do not have to give up drama and contrast because you have a tight budget. Our economy Showpacks provide 1 click show kits. Each kit has economy black core mat available in Paper White, Off White and Black, your choice of economy foam core or matboard backer and resealable, clear bag. Mat window is centered for use with either landscape or portrait images. Economy mats are slightly thinner, .045, have thinner face papers and are made of 100% recycled materials. They are "acid neutral" mats. Although white core mats are now the standard in most commercial work, sometimes you just need a temporary and inexpensive mat. Economy mats are "acid neutral" and are slightly thinner, .045, than standard mats They are buffered with calcium carbonate. This showkit offers a basic economy, 4 ply, cream core mat, economy mat board backer and minimal cost clear, resealable bag. The objective of this showkit is an inexpensive package for maximum volume. Show kit is made up of one cream core mat with centered window, matboard backer and clear, resealable bag. Economy mats are acid-neutral mats, are slightly thinner (.045) and use 100% recycled material.